The Meirlaen pigeons have been in great form again this season. They won the Benzing One Loft Race in Japan over 700km and a 1st National Alençon 2016 (for Reilly & Son), and Etienne has now added a provincial first prize from Pau to his palmares, after having won a second place provincial from Châteauroux earlier this season. He is doing great! Etienne had a slightly different racing team for Pau. He had a different team in mind but he could not count on his first nominated, Cor As 644/10 (2nd National Pau 1,910 p. in 2014 and 52nd National Pau 1,980 p. in 2015). Cor As had a minor injury when he returned home from Limoges, and Etienne knew it would be a bad idea to basket his prize winner for an international race of more than 900km. Instead he will give him a few weeks to recover with a few shorter flights in between. This should accelerate recovery, and it will get him ready for his next races, preferably in July. Sire of 6th Nat. Ace Pigeon Long Distance YL KBDB 2014. He is a son of 1st International Narbonne 12,605 p. Monar BE08-4298283 (in turn a son of invaluable stock dam Yelena) x Daughter Marathonlady BE10-4284777 (a half sister of Yelena). 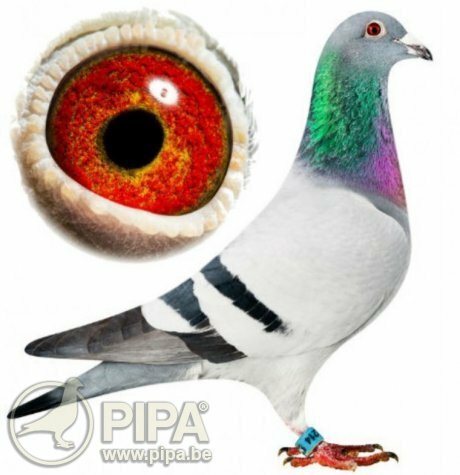 A direct Dr. H.-P. Brockamp from the amazing Euro Diamond DV06720-02-537 (Olympiad Pigeon Cat. E Marathon 2007 in Oostende, 1st Nat. Carcassonne 2,719 p., 3rd Nat. Perpignan 1,452 p., 4th Nat. Bergerac, etc.) x 1st Nat. Ace Hen 2006 DV01186-04-1449 (1st Nat. Ace Hen in 2006). The Meirlaen pigeons are hard workers, difficult to slow down. Etienne's ambition has always been to breed pigeons that can quickly adopt to the ever-changing weather conditions in Western Europe. Pigeons that can only win an early prize in sunny weather but lack the strength to perform in bad weather won't get you very far, especially not in the long distance. That does not mean Etienne Meirlaen does not look after his pigeons. Quite the contrary. All he wants is a pigeon family that performs well in all weather conditions, and this has proven to be a successful approach. He is set for the future, as you can tell from his great results in the long distance in recent weeks. A total of 24 pigeons managed to win a top 10 prize at provincial level, with 34 prizes for 58 pigeons. 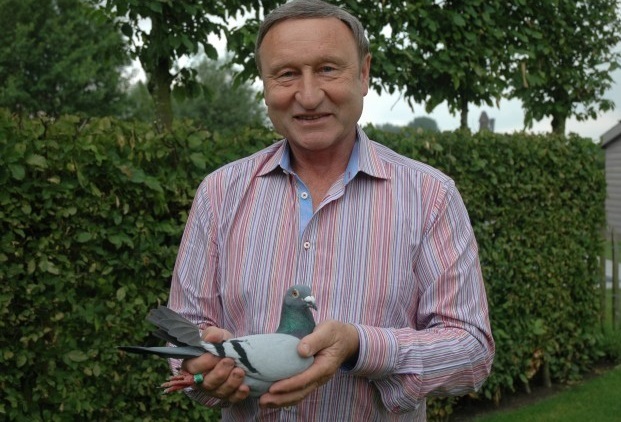 The national results were even better, with 25 prizes per 10 and 39 prizes with 58 pigeons (per 4). ​In fact, Etienne had basketed almost his entire racing team in the final weekend of May, with the exception of five pigeons that would compete in Valence. He basketed 58 pigeons for Limoges and 92 racing birds for Bourges, and each single one of them managed to get back home. There was one pigeon that returned only on Monday but the rest of the team finished early. It takes luck to achieve great results but we think it is most of all a matter of having a carefully selected team of great racing birds. The team had to be satisfied with a second provincial prize from Châteauroux against 2,934 yearlings on 21st of May, but they eventually managed to win a provincial first prize from last weekend's race from Pau, the first international classic of the season. The racing team is clearly in great form, with high prize percentages and plenty of early finishes. They will be looking forward to the important national and international classics of the long distance. Many congratulations to Etienne, Yvette, Aline and the entire Meirlaen team.